The Most Progressive Spanish and English School in Mexico. Social Justice Program Dates and Costs 2019. "It is always better to be in Community"
irrespective of nationality, ethnic origin, race, gender, sexual preference, or age. and its past and current political situation. The instruction is customized to the learners' needs and interest, and rooted in the Paulo Freire methodology, what is applied to the teaching of Spanish as a second language. Students contribute their insights and ask the questions necessary for critical analysis. We offer small, intensive classes at all levels, year-round, in a friendly and relaxed community atmosphere, as well as several Special Programs every year focused on a particular issue or area of interest, which often include travel in the region. Native Spanish-speaking teachers from Mexico, with professional training and extensive experience. Maximum 5 students per class. Five hours of formal intensive classes: 3 hours of linguistic grammar and 2 hours of practice (speaking, writing and listening). “Round-table” discussions every other day on different national and international social justice topics. Activities related to Mexican culture, including: videos, Mexican cooking classes, folk and Latin dance classes, participation in local fiestas, plus excursions to museums, “pueblos” and pyramids . . . and more! CILAC Freire is a small community of teachers, students and activists. Our goal is to promote dialogue between Mexico and people of other cultures. To accomplish that, we attend to the needs of every participant. — teachers, people working in health professions, social workers, clergy, people working with immigrants, lawyers. — activists in many fields: LGBTQ rights and culture, women’s rights, environment, human rights, indigenous rights, housing, education. 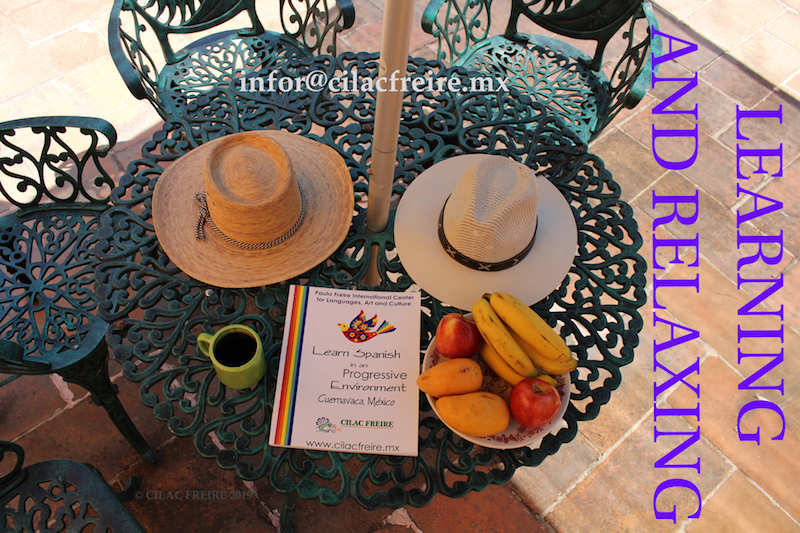 In Cuernavaca, a small, vibrant city with relatively few tourists, you will have constant opportunities to practice your Spanish in daily interactions and experience the daily life of Mexico — at the market, at the zocalo or town center, at political meetings, and at cafes and bookstores. It is easy to visit nearby towns with historic sites and festivals. Students from many countries and universities have received academic credit from their universities for their work at CILAC Freire,and teachers have earned continuing education credits from their school districts. Documentation describing our methodology, texts, schedule and teaching staff can be sent to your university or school district at your request.